Coordinated Multiuser Communications provides for the first time a unified treatment of multiuser detection and multiuser decoding in a single volume. Many communications systems, such as cellular mobile radio and wireless local area networks, are subject to multiple-access interference, caused by a multitude of users sharing a common transmission medium. The performance of receiver systems in such cases can be greatly improved by the application of joint detection and decoding methods. Multiuser detection and decoding not only improve system reliability and capacity, they also simplify the problem of resource allocation. Coordinated Multiuser Communications provides the reader with tools for the design and analysis of joint detection and joint decoding methods. These methods are developed within a unified framework of linear multiple-access channels, which includes code-division multiple-access, multiple antenna channels and orthogonal frequency division multiple access. Emphasis is placed on practical implementation aspects and modern iterative processing techniques for systems both with, and without integrated error control coding. 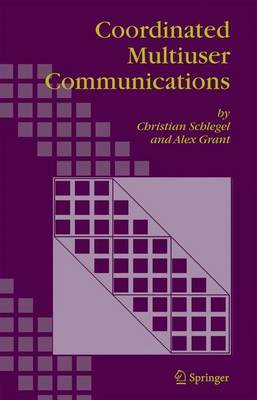 Focusing on the theory and practice of unifying accessing and transmission aspects of communications, this book is a valuable reference for students, researchers and practicing engineers.